Local artist Andrew Mackenzie has been appointed as the Project Artist for the Hawick Flood Protection Scheme. 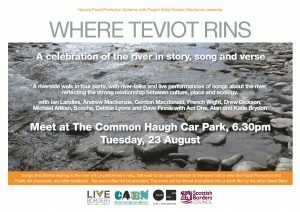 The key priority of the Hawick Flood Protection Scheme works is to protect the town from the effects of a ‘1 in 75’ year flood event on the River Teviot, but the works also offer opportunities to incorporate imaginative artistic proposals, including for permanent public artworks, which will be presented at a public exhibition in Hawick on 22nd and 23rd August 2016. Several working groups have been set up within the community – focusing on opportunities for the local community arising from this major infrastructure project. These groups are made up of people from the community, and focus on various areas which could benefit from developments relating to the scheme – for example: local economy, health and wellbeing, renewable energy. Andrew will be building on work developed by a ‘river culture’ group focusing on the arts. The involvement of a Project Artist to develop artistic proposals, and engage with community groups and schools in workshops and activities relating to the Flood Scheme, has been enabled through a partnership between Scottish Borders Council, CH2M (scheme engineers) and the Creative Arts Business Network (CABN) which is part of Live Borders. Andrew has already worked with Hawick High School pupils, and has engaged with a range of community groups and organisations locally. Andrew Mackenzie is based in Stow. He has exhibited his work extensively both in the UK and abroad. Solo exhibitions include Veined with Shadow Branches at Sarah Myerscough Gallery, London, which included a collaboration with the poet and writer Ken Cockburn. Group exhibitions include A Parliament of Lines at The City Art Centre, Edinburgh which toured to The Pier Art Centre Stromness and RMIT Gallery in Melbourne, and Converge at the Royal Scottish Academy, Edinburgh. He has a wide range of experience working with schools and communities on many different education projects, such as The Living Room Project in Kelso, Natural Identity and Heroes and Villains with Stirling Council, and many projects and workshops with The National Galleries of Scotland. He has recently been working with schools across the Borders delivering portfolio preparation workshops, helping young people access careers in the creative industries. Public Art experience includes projects for North Edinburgh Art Centre, and working with Ginkgo Projects on No 1 Kingsway in London. Andrew will be posting information about his activities through the project Facebook page, and adding more here.